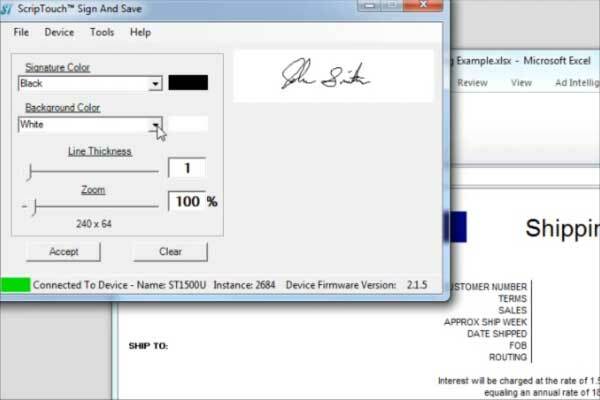 The ScripTouch Excel signature plugin enable anyone with Microsoft Excel 2003, 2007, or 2010 and a Scriptel Signature Pad easily capture signatures from within the document. This plugin bundle is included at no additional charge with our signature capture devices. Signatures are automatically positioned on the location of the actively selected cell, making it easy to capture a live signature in a document that has multiple pages. Need to sign in blue? Signature customization controls appear while signing and allow on the fly personalization of signature color, thickness, background color, and size. Unlike some signature plugins, we place no limits on the number of signatures that can be placed within the document. If your application requires many signatures, we have a solution for you.